Big news! Lost will start showing up on other networks starting in the Fall of 2008. According to this article, LOST will be aired on NBC’s Sci-Fi network and on the Comcast owned G4 channel. It will be a lot of fun when LOST gets a new fan base next year and a new “generation” of LOST fans will join the fray. Hopefully they will enjoy it as much as we have. Use the link below to see pictures from Ryan Ozawa (The Transmission) of last month’s LOST symphony. Included are shots of Jorge Garcia, Terry O’Quinn (who was the host) and Carlton Cuse. They also brought along some props from the old Lost sets; a burned piece of the fuselage, the Dharma logo, and the “torches” used by the Others. 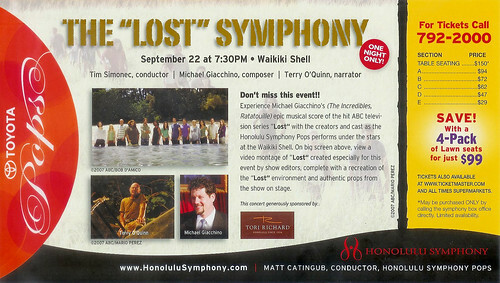 Click here for Pictures of the LOST symphony. Use slide show to see them all in full screen mode.